I am always challenged by writing comments that I think add value to posts. It is a demanding art that lies between the dash-like form of the tweet and the exposition of a blog post. Yes, agreed . . . actually similar to giving good feedback to students in a classroom. It is easy to use “Good Work” but much harder to give specific feedback to help guide the learner. OK, ok, so for once, I’ll comment. Chris, your posts are always interesting and no, your ‘Super’ position doesn’t keep me from posting. I don’t tweet or RT — so I fall into the camp of too much to read, to prep, to mark, to do and never the time to comment. Keep writing, keep inspiring us. I just want more face to face conversations these days — and many of those conversations do include what you write here, even if they don’t include you. Thanks Elizabeth. I appreciate you taking some time to comment. And it is nice to know the posts help to spur conversations – that is the goal. Like you, I crave the face-to-face conversations – and miss the wonderful ones that happen on a regular basis at Riverside. Interesting! I was looking back at old posts on my blog and noticed that people who used to be regular commenters don’t comment any more, but I have new visitors these days. I think I too have fewer comments overall, except for significant posts. I sometimes meet new people who tell me they are avid followers of my blog… yet I have never had a comment from them, which is interesting too. Thanks for rambiling 🙂 Like you, I blog for myself, but find the public sharing, creates some additional accountability. One of the best parts of blogging over the last several years is that I have seen my writing improve – which has made me believe even more in the power of digital writing. … And one more thing. I like your intention, Chris, of offering three comments to the blogs of others for each blog post written. I will make it my aspiration as well. Thanks Dennis – I also think it is a great guide with students. We want to be sure that we are not using these tools as a megaphone but as entry points into conversations. Thanks for the reminders of what is important. I think, much like blogging itself, I feel I need to have something really important to say before I write a comment (or blog). I really should know better. It goes against what I teach and believe; the act of writing is what starts the thinking. I like that – the act of writing is what starts the thinking. I find it challenging to sometimes put myself “out there” with ideas that are not fully developed, but the blog (or the comment) can be a great way to begin to work out my thinking. Appreciate having you in my network. Thanks, and likewise. It really is fighting past the notion that an idea has to be complete before you can publish. Perhaps that’s when you write a book. Before that, on blogs and twitter, we have to have permission (from ourselves) to create and think as we go. I put mental check boxes beside Twitter Love and So Much to Read. I would be tempted to add that some are busy doing. Not meant to be a knock on the conversation but rather that one of the by-products of the increased conversation is that one is left with more clarity about the things one wants to do — suspect some of the decrease in the dialogue is simply people busy “doing”. Aside: One thing I particularly enjoy is finding teachers who are “doing” and getting them to do some “talking” (i.e. create a simple teacher/class blog where they share out what’s happening in their classrooms). Love the post-by-email functionality which simplifies the sharing process. I like to think we are all busy doing and that we will find time to share if we think it is so worthwhile and adds value, until then it doesn’t become a priority. Of course a few years ago, there was so much debate on why change – and now perhaps we are just getting on with it making the change happen. And yes, agree about the post-by-email function . . . although email is “old school” I love to subscribe by email to certain blogs – several that push my thinking. And finally – I always enjoy it when you take time to write and share what you are doing – usually some very cool stuff! Maybe your blog posts are inspiring people to DO more, to go deeper into their teaching/leadership practice and therefore they spend more time working with colleagues on matters that improve learning for all students, instead of commenting. Using a blog to a share ideas and challenge beliefs to encourage new learning and habits is important. But so is doing IT, whatever IT is. Instead of tracking the number of comments per blog, is there a way to measure the affect on student learning each of your posts creates? Just like a teacher may never know how influencial they were to a student, a blogger may never know how they impacted peoples’ lives. Thanks Mike – I like your thinking. Yes, it is nice to think that the posts are influencing thinking and what people are doing. For me, what I like about the comments (and the conversation) is that they help push my thinking – sometimes solidify it and sometimes help my thinking evolve. OK. You got me. The one time I commented on one of your earlier posts about technology in the classroom, I got an email from you saying that it wasn’t the appropriate place for that discussion and you didn’t approve my comment for posting. I took from that, that you weren’t really interested in my comments or having my voice as a part of your discussion and I haven’t attempted posting again. I read all your blogs. I have thoughts on them, but I keep them to myself. As you wrote, you’re my boss and that makes honest posts feel dangerous. Curious what you’ll do with this. Thanks for taking the time to comment Christine. I appreciate your work to incorporate new technologies in the classroom. And thanks for taking the time to be a regular reader. It was very kind that you took the time to write an email a couple years ago about my blog – nice to know you are still engaging. I remember your earlier comment – it was on a post about Seth Godin. You were trying to upload videos and struggling using Sharepoint. It was a situation where I thought it was a discussion better for email as it was not strictly related to the post. I know we followed up back and forth and then you followed up with Gary Kern. Sometimes these kind of issues are often best solved offline. I allow almost all comments to be published – only moderating a few – ones that criticize teachers or schools by name, ones that are completely off topic or use language that is not appropriate. Thanks for continuing to be a reader and engager – I am always interested in a variety of voices. Thanks for posting my comment this time. I am a regular reader and I LOVE technology when it works. I aprreciate your thoughtful reply. I know when I first started blogging 2 years ago I made a focused effort to comment. I think to a certain degree I have become lazy in this area. Concurrently, meaningful conversations mediated as a result of blogging, in formats besides comments, have developed. For example, teachers at work drop by to have face to face conversations with me after reading a post, or a lengthy DM conversation ensues with a Twitter friend over a post or, I meet someone at a conference who remembers a specific post and as a consequence we have an immediate connection. While commenting is no doubt vital to the vibrancy of blogging, I see vibrancy showing up elsewhere. That said, I would like to renew my commitment to commenting as a means build and strengthen community. Thanks Carolyn. I have really enjoyed reading your blog – and shared it with others. I agree that it is probably really a good thing that our digital writing has led to some focused face-to-face conversations. Could it be a bit like adult ed classes – people show up because they’re interested, they want to learn, to be inspired, to grow. But if the instructor poses a question or invites input, the silence is usually deafening. The restraint in the room is palpable; nobody wants to expose themselves or appear foolish. I look forward to your blog posts with much enthusiasm, Chris, and always find something to take away. But it’s true, I have only ever commented on your Facebook re-posts. It’s a “safer” place, with a more diverse audience, where I don’t have to wear the insider’s hat of the edchat world. Thanks for leaving a comment – and yes, the conversations on Facebook do feel much safer. What happened to responding to someone who lays out an argument like this with “your choice”. I appreciate how diligent you have been to comment and encourage over the years. And your blog is great – and while I am one of those guilty of not commenting I always enjoy reading it. I was also always inspired by how regular your wrote. Of course, I always prefer to catch up with you on these kind of topics in “the real world”. I’ve seen a major drop in comments too. And I’m guilty of less commenting myself. Two of my challenges are that I read more on my phone, and ‘on the go’. I’m writing this on my phone now, and it will take me more than twice as long as if I was on my laptop. I’ll read while eating, or sitting in a car waiting to pick up my daughter. Neither of these invite an opportunity for a thoughtful comment response. I wonder how true this is for others? I’ve also noticed that posts don’t last long either. I used to get comments over the span of a week, now the post goes dormant in 2 days unless I or someone else retweets it. And like you, I find that comments make for a far more meaningful blogging experience. I’ll follow your lead and recommit to commenting more frequently, thanks for the inspiration! Thanks Dave for commenting – and for being one of the great models out there. You have often helped me find wonderful new people and ideas to follow and you regularly have engaged in digital conversations. I agree that a few years ago the blog conversations would stretch over a week – now after a couple days everyone has moved on. It is interesting to see the evolution of the use of the tools. Could it be that teachers have so many individualized program students in their classrooms with so many varied issues and no educational assistants that they don’t have the time to comment. The Liberals should be happy about the outcome! BTW, when are the gurus going to put in place curriculum guides that address split classes (social and science themes for split classes) because students studying the same theme twice is not exactly workable in the trenches. Peter – I think finding / making time to engage in social media is definitely an issue. The busyness of our jobs makes it hard to engage. Well… I thought it was just me that had slowed down on my commenting. Now I read this and feel badly – everyone else has slowed down too, which must make you think it is you. But – it’s not you, it’s me (only, it’s us – a lot of us I guess) which might not sweeten the deal for you but don’t take it too personally. Some of the Culture of Yes blogs haven’t resonated with me recently, but I am connecting to other peoples’ blogs (people you have connected us to) and I have recently discovered twitter and other tech interfaces to occupy my need to connect and learn. I have also been busy working on other educational goals lately. So it’s a little of reason #1 #3, #5 and #6 for me….our need to connect is a big as ever, and we are always finding new ways to do so. Thanks for all your leadership – great to have you part of my network. And, while I don’t really write for you – I am sure something will connect . . . I am sure I have a teacher-librarian post in me soon! as an avid blogger for over 7 years, first as a foodie and now in education, I have seen comments in general fall; but only because in my food blog I haven’t had as much time to post and as a result, I no longer post comments on other foodies’ blog posts that I find inspirational. My old food blog posts that are popular still receive comments because in general, foodies like to build community through comments. My popular food posts generally garner over 100 comments each. The blogging etiquette in the community is that if you like a post, you comment on it. Then the IMPORTANT thing here is that the blogger reads the comment and then visits the commenter’s blog and pays back the comment by reading a post or two and paying back the comment. If the commentor doesn’t have a blog, then you simply reply in the same thread and they can track follow-up comments if they wish. Thus, a sort or relationship develops and can last for several years. There is no reason to impose an arbitrary quota of commenting 3 times for each post you create. 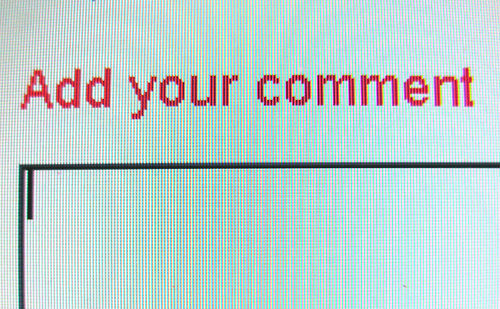 Commenting shouldn’t be arbitrary. It should be a reflection of manners in the real world. It’s a simple enough thing we teach to our youngsters face-to-face so why is it different online? Did little Johnny just say “hello” to you? well, Bella, then make sure you speak up and say “hello” back. If a colleague tells you to your face that she found your workshop inspirational, do you ignore her? No, you thank her. To her face. And if you attend one of her workshops later on, it’s simply nice to tell her what you liked about her workshop too. Just sayin’! As for educational blogs…I do not find that educators in general comment at all for some reason; perhaps because of time constraints (it’s more like work and not a hobby/passion? *hope not*) and perhaps because of culture? I think the fact that the subject matter is political and may challenge educators’ mindsets can often be the issue as it’s pretty scary telling fellow educators what you really think. No one wants to look dumb or not forward-thinking. So though a post may be inspirational or topical, unless educators take on the responsibility of reciprocating comments, I don’t really think there’ll be an increase in comments on education blogs. I see it as an aspect of Digital Citizenship. Perhaps that’s something we should model ourselves before we teach it to our students? Really interesting Linda – great perspective being able to compare your experiences in two different areas. My rule of 3 comments I put in place was really to force me to go out and seek different voices and ideas and make sure that I was not listening to the same ideas from the same people. It is such a new area still – we are figuring out how to use the tools in ways that add value . . . it will be interesting to see where we are in a few years. When I look at my posts that have generated the most comments, they are the ones that are somehow related to parenting – we can respond to these in a more human way, perhaps, and take off our educator lens. Appreciate you sharing your thinking. Hey Chris – I have noticed a huge drop… I am actually very shocked when I go back and see 50 or more comments on a post. My posts are read more now but have less comments… and as most people have said, the increase in number of blogs probably causes people to read more, connect more, but interact less. Also, I notice that instead of commenting, people will often link to a blog post they have written which shows how more people are blogging but also may take away from the dialogue as I am not sure how many people will click on all the links in comments. Another thought that I have… when I first started reading blogs and commenting, I did most of that on my laptop. Now, I read 90% of the time on my phone or ipad. I find I lose comments (especially on blogger/blogspot blogs) once in a while so I make a note to comment later from my laptop… and then that later time when I do this doesn’t come. I also struggle to write anything of length on my mobile devices as I just get frustrated. I need to make a better effort to interact on my blogs too… I am weeks behind responding to people’s comments. Thanks for encouraging me to make a bit more of an effort to comment on posts. Chris – the point you raise about how you interact with blogs is a really good one and not something I have thought of before. Like you, about 90% of my blog reading is on iPhone / iPad – and while I enjoy consuming on those devices, I don’t like producing content. I can barely get a tweet out on a device without a keyboard – we are ol’ school I guess. Glad that we will both be trying to make the effort to engage on blogs – you can build community with your new SD35 colleagues. I think part of the problem is the clock, there is much more to do today, or so it seems to me, than there was just 5 years ago and there are not enough hours in the day. I am responding to this blog, because I think it is important to hear all perspectives but it is after 9:00 at night and I shouldn’t even be looking at work email. Another new curriculum, meetings, meetings, meetings, needy kids, slashed budgets, limited resources. And of course, it is report card time. I would write more but I’m too tired. Thanks Margot – absolutely the work is all consuming. I really appreciate that you take the time to read, and that you have taken the time to respond. I am blessed to work alongside so many amazing educators in West Van who put in so many hours to create great experiences for students. You’ve done a good job of explaining the possibilities. I think it boils down to a combination of factors: educators have limited time during the school year; many educators are developing PLN’s and focusing their attention on connecting with their network contacts; the adoption of Twitter as a means of connecting/communicating; educators using their time to focus on and particular interests, and finally, in the short time since you started blogging, the amount of Internet options has grown exponentially. While comments have gone down, maybe this is just a sign that educators are choosing to engage in more instant, interactive activities. Thanks Rhonda for taking the time to engage on this one. I have really appreciated your comments before – you have a wonderful way to challenge my thinking and your comments have absolutely influenced my thinking. The time issue is definitely real. My blog goes against the trends that I see on commenting with other blogs. Typically the most popular day to comment on my posts is Sunday. I think this speaks to how busy educators are and how Sunday is the only day that we often have that we can devote to professional thinking in the busyness of our lives. Unless of course you are responding at 10:30 on a Friday night like I am tonight. I think you’re spot on with all the possibilities. For me they are all of the above. Instagram is where the action seems to be lately. Thanks – I don’t know how to take it, but more than once I have been told by people that they read my blog just because they want to read to read the comments. I guess whatever brings people to the conversation . . . I took a look through my older posts and my newer posts, and I don’t see a decrease in comments. If anything, I see an increase overall in comments on my posts. Here is a theory to explain this: Blogging, like most social platforms, is divided into smaller communities. In the community of people who interact with your blog (among others) maybe one of the above reasons is reducing the number of comments you get. In the community of bloggers (and people who read blogs) that I am in, none of these reasons you’ve suggested apply. Some things worth noting: I have never had 50+ comments on a thread. I think my maximum is about 20 comments. I know for me it has much to do with the time when I read the blogs. Like a number have said previously, it has to do with the fact that I am reading on a phone not a laptop. As a learner myself in this process I need to think about what is important for me – is it connecting widely or deeply. Just this week, a few of us from SFU reconnected with Margaret Wheatley and her work around the power of conversation. Commenting on blogs does not easily allow for this type of connectedness. I know for me what blogs have become is a discussion starter with others that I want to have face to face. Another important piece in this for me is how I think about what this might do for students who are entering this kind of learning. We need to think about how to guide them to being able to focus deeply as well as broadly. That our time in school needs to be around taking these kinds of idea starters and teaching them how to work with the ideas and the people right around them to generate new conversations. So that is something I would like to hear about – how are teachers teaching students to think deeply using blogs and other social media? Dave – this is a great question – how are we using blogs, social media and digital writing to have students think deeply? I like how it can extend conversations – so we start a conversation face-to-face and can carry it on online and then pick it up face-to-face next time. I suspect we will talk about this next time we see each other . . . having initiated the conversation online. I just want to comment to let you know that I enjoy reading your progressive blog. I love reading different views on education, especially since I am a new parent who cares about education and a high school basketball coach. Keep ’em coming Chris. Thanks. I’m still forwarding links to blogs just as much, and sharing with staff and friends. I like sharing a link, and now with the ability to track “reads” using bitly and other apps, I can see if people are clicking (and hopefully reading). Thanks Dan – I am also sharing as much (or more) than ever. Maybe we are just changing where we engage – and do so in the face-to-face world or via email rather than on the blog. Interesting to note – while it is nice to see what a good discussion this post has started I have received a number of emails from people on it . . . commenting publicly is not for everyone. Hi Chris. Yours is an interesting post and I am glad that you wrote it. You challenge us to think about the “social” in social media. Without the exchange, it is simply the broadcasting of ideas. I am guilty of that. Like others commented, I struggle to find a balance in my workload, personal life and navigating the social digital space. I rarely comment and I am not posting as much either now. I know better and should aspire to do more…but I also give myself permission to let go. I am reminded that “There is a time for everything and a season for every activity under heaven…” Sometimes I think we just need to accept the seasons in our lives. Thanks Elisa – it can be hard to let go . . . I also think that if we thought it was core to our work and learning we would find time. So, in looking at the comments, from so many of the most engaged digital leaders I know – even for us our social participation is not really core (at least yet). That fact that most see commenting as an extra thing we have to make time for signals the fact that it’s still mostly a peripheral space as opposed to a primary space of learning. That’s not a judgment statement but simply my view of the reality. I once came up with this idea http://shareski.ca/y/11 that I think still has merit. I try for a 3:1 post per comment. My biggest concern is that we still comment but I agree it’s mostly on twitter cause it’s easier. That’s fine but as we bantered about last night on, ironically, twitter, it’s not a great space to really challenge and push thinking. Most of us just can’t in 140 and even if some are more gifted in conciseness, it can never replace the more in depth comments that take place in these spaces. In the same way, even the best comment threads cannot replace the best face to face conversations. Thanks for the reference to your post – I like it and the advice is good – if we want others to support us in our learning by engaging in our blogs it should be something we do as well for others. It is interesting to see the comment about from Linda about her experience as a food blogger – where there is an understanding that they if person A comments on person B’s blog that person B will return the favour. As to Twitter – I learn from the links and not from the conversations. I enjoy the conversations on Twitter but they can be a bit cliquey and not really be open to range of ideas. Hi, yes, I was just in Winnipeg speaking with teacher-librarians. Great to hear you are finding your voice – and can tap into your BC experience as Manitoba moves on the journey. I will check in. http://cbc.sh/0Q53C4I Maybe FYI Popular Science gives up comments. Popular Science associate editor Dan Nosowitz says there has been a lot of spam, misinformed writing, racism, sexism, and “basically unsourced nonsense, garbage” in the magazine’s online comment section. This comment could be used to describe the comments on so many sites. Hopefully we in education can help set a better model. Thanks for commenting and the kind words. There is no doubt I will continue blogging . . . it it too important for me to work out my own thinking to stop. Chris, I’ve been online for 4 years, and on reflection, my lack of commenting has been pretty consistent – mostly because I feel like I am back in the role of a total learner! And these days, I’m even MORE involved in reading and surfing and learning and soaking it all in. There is just so much to learn and think about, and I just don’t feel confident or competent enough to comment on most posts I read. Many of the people I follow and read seem to have put so much more thought and reflection into the topics of their posts, and that can be intimidating. Blogs being a forum for discussion is not such a huge part of the culture I’m seeing these days. I have wondered in past years what will evolve in our online spaces when the main mass of teachers begin to join and come online. Are we prepared for it? How and where will discussions occur? Will we devolve into smaller communities, either geographically or based on interests? If we were successful in convincing teachers everywhere that blogs and Twitter Chats are THE place to connect and interact with people – would Twitter and blog platforms break down? (I remember clearly my incredibly painful experience trying to buy Olympic tickets in the lottery, and the system crashing.) And I don’t JUST mean the technological systems – are our human discussion and conversational systems prepared to handle the enormous demand of our fellow educators? Or will we all just sit silently because we’re overwhelmed by the numbers of people reading our comments? Thanks for question, Chris! Interesting Cathy – maybe as Dean Shareski suggested on twitter we don’t want dozens of comments – just a few good ones that push our thinking. I wonder if we are devolving into smaller groups already. Five years ago I would read bloggers from all over the world. Now, with more educators online I find I am reading almost exclusively bloggers from BC and about half of what I read is from those in West Vancouver – this is good that so many more are sharing, but the views I am exposing myself too are not so broad. Thanks for taking the time to comment and engage in the conversation on Twitter. I just found your blog, so I can’t comment on your comment rates. I can, however, say that I find myself commenting less on blogs overall because they seem too general – it feels like the blog posts are attempting to convince me about something I already believe. That’s not a bad thing tho. Blogs can be equally valuable as a personal reflection tool as it is an information text for readers. Thanks Janet for the comment. And my leaving the comment, I have looked up your blog and now will follow – I enjoyed the post on what schools can learn from reality shows. And yes, not all blogs need to be about creating online engagement. For the author they are a public journal and the for the reader a source of thoughtful thinking. Thanks for this blog. I have been following you since I started on Twitter a couple of years ago. I saw you at the SFU conference in Vancouver and thought you had great things to say about technology and how to use technology to enhance student learning. You to me were the highlight of the conference and somewhat intimidating! I think you are right in a sense that we can be intimidated by you being the superintendent or in that my comment may not be up to the standard of all the other very very smart people out there! :). I have actually only commented on 3 blogs! And on yours I had a typo! It is strange as we are all human, but titles and the perception of someone having a higher position or says something better and smarter then us can cause others to not feel confident enough to comment on what has been said. I really enjoy getting comments on my blog, but find that the only time I get comments is if I write a more humorous or different blog relating to a story of some kind of what happened at my school. It is those stories that seem to interest readers enough to respond. This blog post has motivated me to start commenting. Maybe it is ok to just jump in and do it! I agree with others though, the blogs I read for the most part have already made clear points and I don’t feel the need to comment. I have also found I skim more now, there is a large amount of great information out there that it is often hard to wade through all the tweets and blogs to get at what is important for me to read to help me with my work. I guess there is no way other then comments or face to face conversations to know if people enjoy reading blogs that we created. I as well enjoy the writing process and it has helped me to focus more on what is important to me and our school. Since using twitter and reading blogs I have learned so much about becoming a better educator, and feel that whenever I have a question or need help with something I can go to twitter or blogs to get the answer. Thanks for the kind words – sorry I was somewhat intimidating . . . we are all just trying to figure this stuff out. The culture of commenting is an interesting thing to ponder. When I read what I consider to be a good blog, I share it or talk about it with others, but I rarely comment. When I question myself about this the first answer that pops into my head is, “Hmmm, I didn’t realize how important comments are to bloggers. I think I’d better comment.” The only thing I can offer in my defence is that I’m not a blogger so I appreciate the light bulb moment. The second thing that occurs to me is that since we now have blogs we must now also have blog comment etiquette. I just I googled blog etiquette and the rules suggest that I stay on topic and stay off the soap box. Since I agree with that advice, I just erased half my comment but if you do a blog on comments found in the margins of library books, or odd things that fascinate people, I’ll resurrect these remarks 🙂 I will wrap this up with thanks for your great blog and a promise to comment more often. Thanks Sheelah – I feel like I should now do a post on the wildest comment you have ever seen – on blogs, in the margins of books or anywhere else. For me, it is less about the love of comments – but the observation that I have seen a real change over the last few years in how people engage with the blog. I love that the blog starts conversations – no matter where they take place. The etiquette piece is a challenge . . . I often get comments that are way off topic and I am not sure what to do with them – I let some of them go, and not others – stopping those that are clearly personal attacks or completely off topic. Of course this is all really so new so the right thing to do is still an emerging topic. I appreciate your commenting, and thank you for being a reader and kind supporter of my blog over the years. Chris, my lack of commenting is due to the reason, “So much to do (and read), so little time!” Similar to others, I have other priorities competing for my time–planning, evaluating, writing reports, researching, taking care of family, our health, etc. For me, it’s about balance. I enjoy reading your blog regularly and appreciate the interesting information, insights, photos, and stories you share. Thanks Helen- and I appreciate the time you did to respond, and all that you do for our district. I love how you model being connected. I’m so glad you have comments for this one – I’d feel really bad if you wrote about this and still didn’t get the comments 🙂 Thanks for continually blogging – I look forward to your weekly post and often scan through your old posts for new ideas. In fact, we were just talking about your blog in Maple Ridge this week as we discussed ways to share educators blogs in our district. Thanks for the amazing leadership! Yeah – didn’t really think of that when I wrote it, it could have been terribly sad if this post got no feedback. I appreciate your kind words, and I do love blogging. I also love to read your ongoing stories told through your blog – such a wonderful archive of the work you and others are doing. I imagine your blog becoming a wonderful book one day. Wow, LOTS of great comments here ! I really enjoy your blog and am glad you are continuing to post such insightful experiences and wisdom. However, I rarely get the chance to read all my emails, let alone respond to the ones that aren’t directly related to work/teaching. It seems such is life in public education. Please mark me in the “So much to read, so little time to write” zone. Thanks – I get twitchy as I continue to hear the “ding” of new emails coming in. It is a full but amazing life in public education. Chris, as many have stated, the plethora of blogs,especially microblogs, leaves little time for true online exchanges. I’ve found that as my professional learning network has expanded, the number of deep exchanges has decreased; however, there is always someone willing to comment when a controversial topic is presented. I agree that the comments have decreased; however, the volume of perspectives and insights in posts and curated posts has increased. Either way, it’s great to be a connected educator! Thanks Tom – it is great to be connected with you. I definitely agree that there is a greater range of voices in the digital space than ever and that is a great thing. And as I have seen from the comments on this post we have a wonderful connected community. re: where have they gone… I think they’ve gone to the twittersphere Chris. Yvonne – that is definitely part of it. We have become addicted to the discussion in the instant. Chris, I would be in the “lurker” camp as I read but rarely comment on blogs. So I wouldn’t be part of your dwindling numbers, since I rarely commented in the first place. As to why I don’t, the Tyranny of Time tops the list. If I had professional time I could set aside, mid-morning, to focus on reading a blog and reflecting in-depth on its ideas, I would love to engage more. Maybe if one day I have a gazillion “prep” minutes! As a teacher, I am constantly busy and inundated with tasks to do. Thanks to no lunch supervision in West Van, at least I can actually eat. I do, however, appreciate time-table embedded collaborative time, because I can sit and focus on improving student learning alongside colleagues, and one avenue to deepening our professional learning can be reading a blog together, one that pertains to our growth plan and collaborative goals. Our time is still limited so I doubt I would comment… For the moment, I browse some blogs for late-night reading and am commenting this time because how could I not? Thanks Karen. I appreciate your leadership with professional learning in our district – and it is very kind that you have commented on this post. And lurkers are great, I am a regular lurker on a number of blogs – but I take the ideas and often share them with others. It is still such a new technology, we are trying to figure out how best to use it for our professional benefit. Oh, the irony of what just happened illustrated the point I wanted to make. Most of my Twitter use occurs via cell phone app, and that’s the key reason I don’t comment a lot. Given the enticing nature of your post, I challenged myself to overcome the mechanical barrier of keyboarding on the phone (inefficient), of not being able to see the blogger’s post or others’ comments while I composed a comment (interferes with ability to compose a thoughtful, connected reply), I muddled with the edits, and then lost the whole (amazing) comment at the verification stage. This has been–almost without exception–my experience with commenting on posts I come across via Twitter. It’s a deterrent. All of this said, the importance of commenting is obvious. True community is reciprocal in nature. Perhaps our hard-wired habits of being consumers of information continue to subtly overshadow our patterns of interaction, and it will take collective consciousness (and periodic reawakening) to keep us focused on the value of online community. We know we have to balance the benefits we receive with what we give back, if we want online community to realize its potential of being personal and enriching. One more thought: I know that I receive more Christmas cards than I write and send. Some people in my life are so generous and creative–and so organized–that they pose, compose and send out those seasonal messages every single December. Not everyone sends cards, but most of us receive some. Perhaps that print-based analogy teaches us something about human relationship–it can endure without perfect symmetrical reciprocity. However, I do reciprocate in other ways in those relationships because I know those people personally and have other means to do so. Is that true for all of our online connections? No, it’s not. Realizing the value of our online community means investing in discussion. Comments are a mode of investing. Human busyness isn’t going away–never has and never will. Community is only a strong as the contributions of its members. Thanks for nudging us awake. Thanks Maureen for overcoming the obstacles of our cell phone driven lives and commenting. I think your Christmas card comparison is a really good one – not something I have ever thought about. While we can endure “without perfect symmetrical reciprocity” (love that phrase) feeling guilty when I feel I am not living up to my end of the bargain. And no doubt, there are other ways to continue the relationship to a piece of digital writing than to just digitally respond on the blog. Chris, thanks for your ongoing leadership in this province. I’ve been reading and sharing blog posts for some time now, but have only recently begun commenting. For me the growth and change happened as I began to find my voice and create my own content online through blogs and twitter. The personal collaboration available online is so valuable, I think its really something we need to encourage others to participate in. Obviously modeling is a huge part of the way you do this, but what other methods have you found most effective in encouraging other educators to share their learning? Steve – thanks for the comment and the kind words. My journey has been similar – it has taken a while to find my digital voice. I think colleagues will share their learning if they see it as valuable and meaningful. One project I have seen recently is a group of primary teachers began to use Twitter to share student work. The challenge for them was that they all worked part-time but wanted to collaborate . . . Twitter became an answer to a problem – how do we share what we are doing with each other? What challenge can you solve via sharing? Another possible entry point is a book club online or other similar event that might bring in new users for a short-time and then hopefully they will stick around. After reading your blog and the replies, one thing that I would add is timeliness. Sometimes I feels the conversation has ended, or appears to have ended. I also concur with your and others points about time. I find I read often – mostly through twitter and often on the fly – go back to what I want to spend time on, reflect, then practice, and blog (or at least I’m starting). Looking forward to seeing you in Qualicum SD69 for the teacher Pro-d day in January 2014. Thanks Rudy. I am finding that when I write a blog post there is a spike in immediate attention and then everyone moves on. This is quite different than a couple years ago when I would get regular attention for a more sustained length of time. So, yes, I think this is part of it – if you don’t come to the conversation immediately the crowd has moved on. I am looking forward to meeting folks in Qualicum.